Redapt's RD-U series of Reducers provide a method of matching electrical threadforms on hazardous area approved equipment. Ex approval maintains hazardous location certification and the overall integrity of the installation. 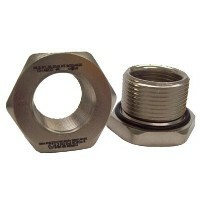 Manufactured from hexagon material to facilitate an easy installation, this Reducer will convert holes which fit size 1" NPT male threads to a female M20 x 1.5 threaded hub. The RD-U series of Reducers are certified to protection concepts Exd "Flameproof" and Exe "Increased Safety" for use in Zone 1 and Zone 2 applications. Approved to the latest international standards, ATEX (CENELEC), IECEx and GOST-R hazardous area certificates are available. Additionally, CSA approval certificates can be supplied to cover use in North American and Canadian Class I, Division 1 and Class I, Zone 1 applications. While designed for use within the hazardous locations present in oil, gas and petrochemical installations, Redapt's Thread Reducers are also commonly used in Industrial & Commercial applications providing a quick and easy solution when connecting to international components or machinery. None: Male thread is tapered. Thread sealant should be used to maintain the desired IP rating. Ex de I & IIC IP66/67/68 Class I Zone 1 & 2 Groups A, B, C & D.
Looking for a different size or material? Other Ex fittings?